Born in London Sharia trained at The Brit School and at Rambert School of Ballet and Contemporary Dance. She performed works by Christopher Bruce,Robert Cohan and Ross Mckim. 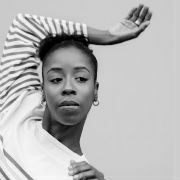 In January 2017 Sharia joined Rambert Company as an apprentice dancer. Her career highlights so far include Rambert’s youth dance company, Quicksilver, alongside London Contemporary Dance School’s CAT scheme. Sharia toured nationally and internationally with INALA, choreographed by Mark Baldwin. She was an apprentice dancer with Richard Alston Dance Company for one year, then a company dancer for Michael Clark Company.